Due to several manufacturers discontinuing production of this drug, supplies and prices for this drug have risen dramatically. If supply begins to match demand again, prices should drop accordingly. WARNING: Before taking this drug for treatment of an irregular heartbeat, you should discuss your risks and benefits of treatment with your doctor or pharmacist. This drug should be used only in carefully selected patients. Many heart drugs like quinidine (antiarrhythmics) are very effective, but they can infrequently cause new serious (possibly fatal) irregular heartbeats. USES: This medication is used to treat or prevent many types of irregular heartbeats (heart arrhythmias such as atrial fibrillation). Quinidine can greatly improve your ability to perform normal activities by decreasing the number of irregular heartbeats you have. However, it may not stop all your irregular heartbeats completely. It works by blocking abnormal heartbeat signals. Before and while you are using quinidine, your doctor may prescribe other medications (e.g., "blood thinners"/anticoagulants such as warfarin, beta blockers such as metoprolol) to shrink any blood clots in the heart and to slow your pulse. OTHER USES: This section contains uses of this drug that are not listed in the approved professional labeling for the drug but that may be prescribed by your health care professional. Use this drug for a condition that is listed in this section only if it has been so prescribed by your health care professional. Quinidine may also be used to treat malaria. HOW TO USE: Before starting this drug, the manufacturer recommends that you take a test dose (usually a smaller amount than your regular dose) to determine whether you are allergic to it. Consult your doctor or pharmacist for details. Take this medication by mouth with or without food with a full glass of liquid (8 ounces/240 milliliters) as directed by your doctor. This medication is best taken on an empty stomach, but taking it with food may help decrease stomach upset. Do not lie down for 10 minutes after taking this medication. Do not crush or chew extended-release tablets. Doing so can release all of the drug at once, increasing the risk of side effects. Also, do not split the tablets unless they have a score line and your doctor or pharmacist tells you to do so. Swallow the whole or split tablet without crushing or chewing. There are different brands and forms of this medication available. Not all have identical effects. Do not change quinidine products without talking to your doctor or pharmacist. Dosage is based on your medical condition and response to treatment. If you are taking regular-release quinidine for an irregular heartbeat, the manufacturer recommends that you take no more than 4 grams daily. Eating grapefruit or drinking grapefruit juice may increase the amount of certain medications in your bloodstream, including quinidine. Consult your doctor or pharmacist for more details. Avoid large changes in your dietary salt intake while being treated with this medication unless your doctor instructs you otherwise. The amount of salt in your diet may affect the amount of quinidine absorbed by your system. Consult your doctor or pharmacist for more details. Use this medication regularly to get the most benefit from it. To help you remember, take it at the same time(s) each day. Tell your doctor if your condition does not improve or if it worsens. SIDE EFFECTS: Diarrhea, nausea, vomiting, loss of appetite, stomach pain/cramps, or a burning feeling in throat or chest (e.g., heartburn) may occur. If any of these effects persist or worsen, tell your doctor or pharmacist promptly. Remember that your doctor has prescribed this medication because he or she has judged that the benefit to you is greater than the risk of side effects. Many people using this medication do not have serious side effects. Seek immediate medical attention if any of these unlikely but serious side effects occur: severe dizziness, fainting, sudden change in heartbeat (faster/slower/more irregular). Tell your doctor immediately if any of these unlikely but serious side effects occur: vision changes, eye pain, muscle pain, unusual sweating or shakiness (signs of low blood sugar). Tell your doctor immediately if any of these rare but very serious side effects occur: unexplained fever/signs of infection (e.g., persistent sore throat), easy bruising/bleeding, extreme tiredness, dark urine, persistent nausea/vomiting, yellowing eyes/skin, lupus-like symptoms (joint/muscle pain, chest pain, change in the amount of urine). A very serious allergic reaction to this drug is rare. However, seek immediate medical attention if you notice any symptoms of a serious allergic reaction, including: rash, itching/swelling (especially of the face/tongue/throat), severe dizziness, trouble breathing. One type of reaction (cinchonism) can occur after even a single dose of this drug. Contact your doctor of pharmacist promptly if you notice symptoms such as ringing in the ears, sudden hearing problems, headache, blurred vision, confusion. Your dosage may need to be adjusted. Certain long-acting brands of quinidine may appear as a whole tablet in the stool. This is the empty shell left after the medicine has been absorbed by the body. It is harmless. This is not a complete list of possible side effects. If you notice other effects not listed above, contact your doctor or pharmacist. In the US - Call your doctor for medical advice about side effects. You may report side effects to FDA at 1-800-FDA-1088. In Canada - Call your doctor for medical advice about side effects. You may report side effects to Health Canada at 1-866-234-2345. PRECAUTIONS: Before taking quinidine, tell your doctor or pharmacist if you are allergic to it; or to quinine; or if you have any other allergies. This product may contain inactive ingredients, which can cause allergic reactions or other problems. Talk to your pharmacist for more details. This medication should not be used if you have certain medical conditions. Before using this medicine, consult your doctor or pharmacist if you have: certain types of heart disease (e.g., incomplete or complete heart block without an artificial pacemaker, torsades-type irregular heartbeats, digitalis toxicity), very low blood pressure, history of easy bruising/bleeding (thrombocytopenic purpura) with use of quinine or quinidine, severe muscle weakness (myasthenia gravis). Before using this medication, tell your doctor or pharmacist your medical history, especially of: kidney disease, liver disease, a certain blood disorder (G6PD deficiency), asthma, current infection with fever. 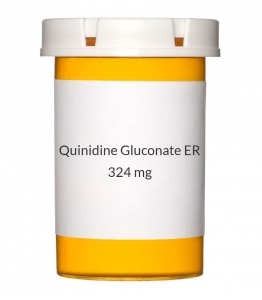 Quinidine may cause a condition that affects the heart rhythm (QT prolongation). QT prolongation can infrequently result in serious (rarely fatal) fast/irregular heartbeat and other symptoms (such as severe dizziness, fainting) that require immediate medical attention. The risk of QT prolongation may be increased if you have certain medical conditions or are taking other drugs that may affect the heart rhythm (see also Drug Interactions section). Before using quinidine, tell your doctor or pharmacist if you have any of the following conditions: certain heart problems (heart failure, slow heartbeat, QT prolongation in the EKG), family history of certain heart problems (QT prolongation in the EKG, sudden cardiac death). Low levels of potassium or magnesium in the blood may also increase your risk of QT prolongation. This risk may increase if you use certain drugs (such as diuretics/"water pills") or if you have conditions such as severe sweating, diarrhea, or vomiting. Talk to your doctor about using quinidine safely. This drug may make you dizzy. Do not drive, use machinery, or do any activity that requires alertness until you are sure you can perform such activities safely. Limit alcoholic beverages. Before having surgery, tell your doctor that you are using this medication. Kidney function declines as you grow older. This medication is removed by the kidneys. Therefore, elderly people may be at greater risk for serious side effects (such as dizziness) while using this drug. During pregnancy, this medication should be used only when clearly needed. Discuss the risks and benefits with your doctor. This medication passes into breast milk. Consult your doctor before breast-feeding. DRUG INTERACTIONS: Drug interactions may change how your medications work or increase your risk for serious side effects. This document does not contain all possible drug interactions. Keep a list of all the products you use (including prescription/nonprescription drugs and herbal products) and share it with your doctor and pharmacist. Do not start, stop, or change the dosage of any medicines without your doctor's approval. Some products that may interact with this drug include: arbutamine, cisapride, fingolimod, propafenone. Other medications can affect the removal of quinidine from your body, which may affect how quinidine works. Examples include mifepristone, certain azole antifungals (including fluconazole, itraconazole, posaconazole, voriconazole), certain protease inhibitors (such as nelfinavir, ritonavir, tipranavir), among others. This medication can slow down the removal of other medications from your body, which may affect how they work. Examples of affected drugs include aliskiren, digoxin, mefloquine, tricyclic antidepressants (such as desipramine, imipramine), among others. Many drugs besides quinidine may affect the heart rhythm (QT prolongation), including artemether/lumefantrine, ranolazine, toremifene, antiarrhythmic drugs (such as amiodarone, disopyramide, dofetilide, dronedarone, ibutilide, procainamide, sotalol), antipsychotics (such as pimozide, thioridazine, ziprasidone), certain quinolone antibiotics (grepafloxacin, sparfloxacin), among others. Before using this medication, tell your doctor or pharmacist of all prescription and nonprescription/herbal products you may use, especially: large amounts of antacids (e.g., sodium bicarbonate), barbiturates (e.g., phenobarbital), carbamazepine, rifamycins (e.g., rifampin, rifabutin), phenytoin, carbonic anhydrase inhibitors (e.g., acetazolamide), aripiprazole, atomoxetine, codeine, hydrocodone, loperamide, medication for high blood pressure (e.g., nifedipine, verapamil, diltiazem), certain macrolide antibiotics (e.g., erythromycin, clarithromycin), quinupristin/dalfopristin, etravirine, amprenavir/fosamprenavir. OVERDOSE: If overdose is suspected, contact your local poison control center or emergency room immediately. US residents can call the US National Poison Hotline at 1-800-222-1222. Canada residents can call a provincial poison control center. Symptoms of overdose may include: severe dizziness/fainting, hallucinations, seizures. NOTES: Do not share this medication with others. Laboratory and/or medical tests (e.g., complete blood count, liver/kidney function tests, quinidine blood levels, EKG) should be performed periodically to monitor your progress or check for side effects. Consult your doctor for more details.